by Assyrian Policy Institute, November 27, 2018. The absence of laws to protect the spirit and purpose of the quota — first by mandating that only Christian voters can select their representatives, and second by prohibiting the use of financial patronage by dominant groups to colonize the political landscape of marginalized ethno-religious populations — has therefore resulted in the near-complete elimination of independent Christian Assyrian political representation in Iraq's 2018 parliamentary elections. The election results for Christian seats demonstrate the growing sophistication of groups abusing the proxy system. 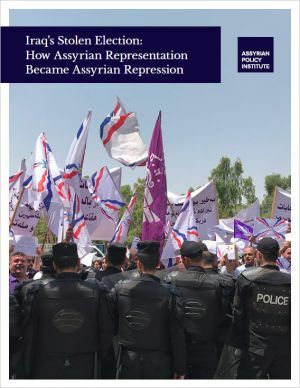 The structure of this system splinters, destabilizes, and enfeebles independent Assyrian political representation, and worryingly, it is becoming increasingly normalized and institutionalized by the dominant groups who benefit from it. This negative trend has occurred in every federal, regional, and provincial election since 2003 and has been detrimental to Assyrian interests from the establishment of the quota system. The massive documentation supporting the alleged abuse of the quota system showed that it significantly impacted the election results and overshadowed the votes of the Assyrian community in Iraq.